If the name, Tim James, sounds familiar to you, it’s probably because he was a 1999 first round draft pick of the Miami Heat in the NBA draft. He was drafted 25th overall by the Heat and played for that team, the then-Charlotte Hornets, and the Philadelphia 76ers. Now, he is serving America as an enlisted soldier in the U.S. Army, and he’s stationed in Iraq. It’s a refreshing contrast with modern-day NBA players who are too busy procuring groupies, acting like they’re in rap videos, and doing other things that are detrimental to American life. Though he wasn’t a huge NBA star and didn’t start games, James made several million dollars, and he could choose an easy life now raising his son. But he chose this, instead. 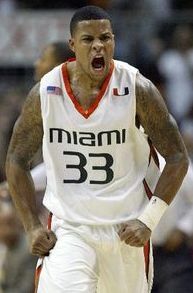 The former University of Miami basketball star and former Miami Heat first-round pick enlisted in the Army a year ago, at the age of 31, and now he finds himself in the dusty, dirty center of a war. . . . He made almost $2.5 million playing for the Heat, Hornets and 76ers. The Heat’s per diem of $113 means an NBA player gets more in meal money a season than the $2,000 a soldier of James’ specialist rank will earn in a month. More than triple, actually. And James earned plenty playing professionally in Japan, Turkey and Israel, too. But as he traveled all over the globe playing his beloved game, seeing a world he never thought he’d see growing up poor in Miami, he didn’t learn to merely value or appreciate America’s freedoms. He decided he wanted to fight to protect them, too. . . .
James hasn’t shared his past with fellow soldiers. Quiet, remember? Humble, too. He wanted to be just another teammate. So none of James’ fellow soldiers knew he used to play pro basketball, though they all said he should have after he scorched those younger soldiers in a pickup game one day during training. He didn’t tell them after that, either. . . . But what if that means having to kill someone? There’s a long pause on the other end of the phone line. . . .
“As a soldier, I do as trained,” he says. James is at Camp Speicher, the massive base near Tikrit, 135 kilometers north of Baghdad, not far from Saddam Hussein’s hometown and where insurgents still are a perpetual threat. For Miami Northwestern High, the Miami Hurricanes, three NBA teams and some foreign clubs, he was forward Tim James. For the Army, he’s Spc. Tim James of Task Force ODIN — short for Observe, Detect, Identify, Neutralize. In layman’s terms, he’s part of the unit tasked with watching and catching the bad guys before they plant bombs. . . .
James spent years thinking about the prospects of a military career. . . .
“I think of myself as a patriot,” James said. “I wanted to give back to a country that gave so much to me.” . . .
James joined the Army on Sept. 12, 2008. The training was brutal, even for a six-foot-eight basketball player whose athleticism had drawn raves since junior high school. James slept outside in frigid night air, scaled seven-story towers, endured 15-kilometer marches (“with full battle rattle, as they say,” he said), and learned how to take apart and reassemble his weapon. He never questioned if he was making the right decision. “I have no doubts,” James said. “I have no regrets. Not one bit.” . . .
“The work we do, while being important to us, is made possible by the efforts of our soldiers in the Middle East,” said [Miami Heat President Pat] Riley, who coached James in his lone season with the team. There have already been comparisons with Pat Tillman, the only other pro athlete of a major sport to serve. It’s believed that James is the first former NBA player to enlist. And while Pat Tillman was a patriot and a hero, I hope James will come home alive . . . and that we won’t see endless Tillman Trutherism-style stuff from the James family. What a great story Debbie. Tim James is the kind of role model that kids should be looking up to. It’s unfortunate his service is not receiving more attention. Thank you for giving him the spotlight. Was listening to Savage and he had played a clip of a Presidential Historian Brinkley referring to Ted Kennedy as an “uberMensch” and he said if Kennedy was an Ubermensch, what did it make us common folk. Point is, this guy is an ubermensch and thanks Debbie for posting this. Also, I believe there were two other NFLers (one was a former teammate of Tillman) to have served as well since 9/11. As an American who looks like him, I AM PROUD. At least he is not out hating other Americans who submitted to allah. You must be ONE HOT GUY! I wish Tim James all the luck in the world out there. Lord only knows he will need it. This is such an inspirational story. This guy is truly an American hero, and his humility in serving his country and not making it public about his basketball career is something that most of these sports stars wouldn’t understand. I don’t begrudge these sports stars for how they lead their lives, it is the American way and they deserve to make as much money and bask in the limelight as much as they want. Don’t get me wrong, I am a sports junkie who loves football and hockey. It is just too bad that there aren’t more role models like James who are or were in the limelight and go out and set such a positive example for our youth and the general populace. James’ patriotism and his story should be mandatory reading and discussed in our public schools. But that would go against B. Hussein Obama and his lackey’s attitudes towards how we should educate our youth. If and or when Obama’s administration actually implement their “civilian national security force” (ie. Hitler Youth), I can almost guarentee that James’ story won’t be in the forced indocterination of our youth. Their socialistic policies will be the predominate training, with a lot of Hate America propoganda. Just an aside – I know there are quite a few pro athletes who are very patriotic and are good, upstanding citizens. I had a friend in high school who went to college, played football and was drafted in the first round to an NFL team. I got out of high school and joined the Marines. At our 5th high school reunion, I had the opportunity to talk to him. We hadn’t talked since graduating high school. He was more impressed that I was serving in the Marines than his football career. Whenever I tried to discuss his football career, he would try to change the subject back to my service. This was one of those moments in my life that I will never forget. Even though he had attained a position in life that was by far more lucrative and he had the respect of many people, he thought that what I was doing was more important than what he was pursuing. Isn’t America great! We need more men like this in our country. Much like Patrick Tillman, May He Rest in Peace, God speed, Tim James. Good stuff Debbie! You have the gift of finding interesting. stories that are not presented in the mainstream media. Much props to Tim James for his service, his patriotism, and his humility…. Debbie has a nose (as pretty as it is)for a good story. Thanks for the story Debbie. Sadly, patriotism and the MSM don’t mix very well these days. (Played High school, College and Pro ball in Miami)This kid is so what the inner city youths need right now. A true male role model for Kids to look up to. I hope he runs for public office someday I’ll vote for him. G-d bless Tim James! People like Tim renew my faith and confidence in America as a nation of heroes that it is. – and thanks also to Debbie for posting this story in a place where those of us fed up with the MSM will actually get to read it! Tim James I salute you sir, come home to us safe. Sam Adams, they never did. Tim is an amazing human being who puts others before self. I certainly respect Tim James for his brave and selfless decision to fight for his country. He sets a positive example for all Americans. A real role model and hero … maybe Bret Farve should consider trying on this sort of uniform instead only shopping in the NFL collection (he certainly wouldn’t be bored)! I wonder if HOprah will mention this patriot on her website? It is sad that all the military role models that come out of the inner city and the MSM and the likes of HOprah wont acknowledge them. I guess military role models don’t fit the agenda of the race hustlers. Maybe because it doesn’t fit the victimization mindset. Great post Debbie. Hope he gets a muzzie for mommy. Joe – Oh yeah, Get Some!! It’s too bad carpet bombing like in WWII wouldn’t be effective in the desert to create a fire storm to wipe out these terrorist strongholds. Sometimes it works sometimes you have to work it a lil. “endless Tillman Trutherism-style stuff “????? The military lied, repeatedly, and ordered their soldiers to lie, to destroy evidence (they immediately had his uniform burned, there in the field — unusual? ), TO THE FAMILY of a dead soldier, so that they could make up a propaganda story to use for recruiting. All because he was famous, and they could use that. The family simply demanded to know what actually happened to their son; all they wanted was an HONEST answer from the institution their son gave his life to. And you act like they were irritating jerks for demanding an honest answer? You have no sense of honor or decency. Oh yeah Lauren, can you provide any type of proof that the US Armed Forces order our brave soldiers (who are BTW defending you’re freedoms and liberty to spew hatred against our brave soldiers) and destroy evidence as you claimed? Lauren, had this been during the WWII days and you were spreading hatred against the US military, you’d be either speaking german or be a large piece of lampshade. And far as I’m concerned Lauren, you are the “enemy within/enemy of the state” to have this vile and repugnant hatred against our military. And you’re the one who has NO sense of honor and deceny Lauren, NOT Debbie Schlussel, to her own credit she supports our military 100% unlike you who bash, attack and belittle US military who’s currently protecting you’re right to be ungrateful towards them!